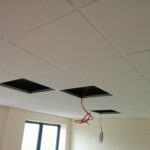 Have your Armstrong Ceiling installed by reliable, experienced, competent contractor. We work as a sub-contractor, or directly for end users. We are up to speed with our health and safety requirements, hold relevant insurances, carry out related training, hold the ConstructionLine Gold accreditation, and are FIS Accredited. Offices, Shops, Schools, Commercial Buildings. 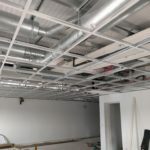 and they’re just the ones we can think of..
Armstrong suspended ceilings are generally installed in either a 600×600 or 1200×600 module, using a 24mm or 15mm width grid system; by far the most commonly used combination is a 600×600 module in a 24mm grid with a lay-in tile. A wide number of edge details are available for their mineral tiles. 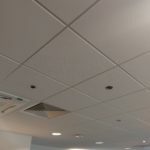 If we can help you with a specified Armstrong ceiling tile, or a specified Armstrong ceiling installation, please do get in touch. We’re well versed in the Armstrong World Industries installation guidelines, which detail the nuisances of their suspended ceiling systems. They can also be used for clean room ceilings. 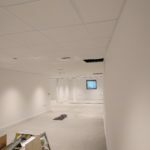 The pictures below show a 24mm grid during installation, then a few pictures of some tegular & microlook Dune ceilings towards the end of various installations.